F3 was founded in an effort to plant, grow and serve small workout groups for the invigoration of male community leadership. 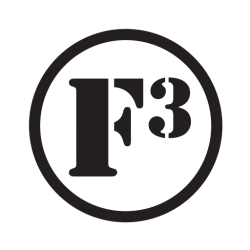 The five core principles of F3 state all workouts are free of charge, and workouts are open to all men. Workouts are held outdoors — rain or shine, heat or cold. Men who participate lead the workouts in a rotating fashion, with no training or certification necessary. Finally, workouts end with a Circle of Trust. Today, over 16,000 men, in over 16 states, meet to workout (fitness), build camaraderie (fellowship) and serve (faith).